EXPLORE THE 4 YEAR OLD CURRICULUM. 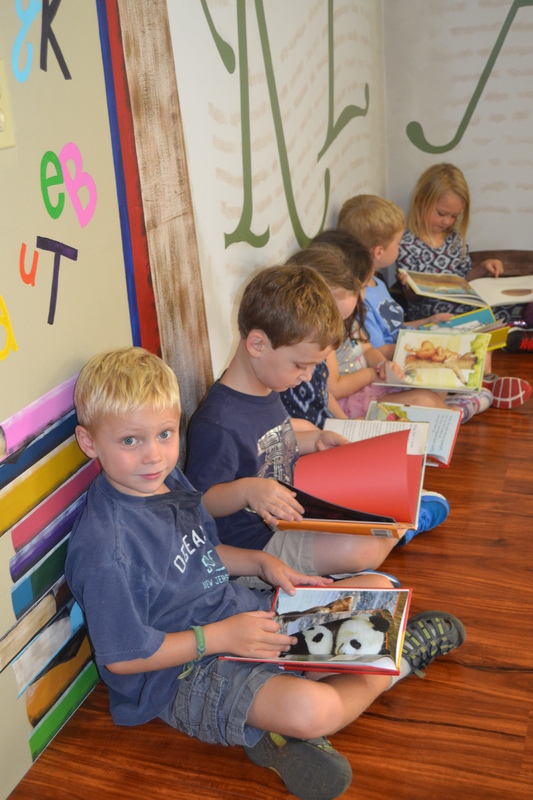 The early reading program introduces classic children’s literature to develop a foundation for visual, listening, oral, and conceptual development as well as creative expression. Students will hear and learn stories such as Little Red Riding Hood, The Three Little Bears, La Tortuga, Peter and the Wolf, and many others. Cross-curricular strands are woven into each reading unit so children are exposed to math and science concepts, social studies, music, and art throughout the year. The early reading program places emphasis on the reading-writing connection, encouraging students to begin creatively expressing their ideas. Letter instruction is integrated into overall instruction as part of a student’s developing awareness of the close connection of reading and writing. Letter identification and phonetic lessons are presented in the context of stories rather than as isolated bits of knowledge. The Wood Acres early numeracy program is a comprehensive and challenging curriculum linking young children’s interests and abilities with the world of math. Our program integrates the learning of mathematics into music, art, and movement, as well as early literacy. Teachers implement whole group instruction, small group teaching, and individual exploration with each lesson while stimulating playful yet purposeful learning. Classroom storybooks are introduced at the beginning of each lesson facilitating not only new mathematical ideas, but also language development as well. Students in the Early School Program will gain a global understanding of self, people and their lives, friends and family, and their immediate environment. They will also gain an increasing awareness of the relationship between themselves and the groups to which they belong. Wood Acres students will learn how to contribute to the successful functioning of the classroom community. They will also discover the similarities and differences among people in global communities. It is never too early to begin looking at the world through a more global perspective. Preschool children are naturally curious about the world around them. Wood Acres students begin activities in exploration, investigation, and observation. They will develop their observational skills by using their senses to gather and record information. They will begin making predictions and have discussions about their ideas. Students will examine change over time in natural settings as well as develop respect for living things in the environment. Students are introduced to general concepts of shape, form and color, leaving the detail and interpretation to the individual child. Independence, imagination, and creative expression are encouraged through exposure to artists and their techniques. These stepping stones will be the foundation for your little Van Gogh, Monet, or Mary Cassatt. The Wood Acres School Music Program is specifically tailored to each age and is founded on the musical principle that a child has a song in his or her heart, a tune is his or her voice, and the passion to let it be free! By developing a musical “ear”, building the student’s confidence to be musical and just have fun with song and lyric, a child’s musicality can be nurtured and developed. Physical education emphasizes the development of small and gross motor movements as well as the rudiments of cooperative games and activities appropriate for these young students. It may seem just like play to a three or four year old, but the program is based on developing the skills necessary for becoming a healthy, happy, and physically fit young person. Paco and Lola, the Wood Acres puppet versions of Dora and Diego, introduce Spanish to the students in the early school programs. Music, songs, poems, finger plays, and games are used to provide a multi-sensory experience for students to begin listening, understanding, and speaking Spanish. Classroom teachers then reinforce Spanish vocabulary and culture in reading and cultural activities within the classroom.